For several hundred years, instruments made by Antonio Stradivari (1644-1737) and Giuseppe Guarneri del Gesù (1698-1744) have been prized by artists and collectors for their extraordinary tonal qualities and unrivaled playing characteristics. Although instruments made by their contemporaries have become quite valuable, none are ever chosen above those of Stradivari and Guarneri del Gesù. Antonio Stradivari lived a long and remarkably productive life — sons Francesco and Omobono assisted the master for his last forty years. There are nearly six hundred and fifty surviving Stradivari instruments, including sixty cellos and fourteen violas. Guarneri del Gesù, who had a much shorter working period, produced fewer than one hundred and thirty-five violins and only one cello. Fine instruments are valued on three criteria — period, physical condition, and history or provenance. Generally speaking, Stradivari violins made after 1700 are the most valuable, reaching a peak around 1715. Pre-1700 Stradivari instruments tend to lessen in value the earlier they were made. Guarneri instruments are divided into three periods including the 1720s, his early period when he worked with his father; the 1730s, his most productive period; and 1740-1744, his late and most valuable period. Instruments by these two masters have commanded high prices since the end of the 18th century and have never been easily affordable by rank-and-file musicians. In this country in the 1920s, sales were in the range of $25,000 to $50,000. Toward the end of the 1960s, the violin market began to change as examples of fine violins sold for amounts approaching $100,000. At this time, the teaching method developed by Dr. Suzuki was leading to nearly universal education of Western music in Japan. As millions of children were taught the violin, audiences for Western music grew at an incredible pace. By the early 1970s the demand for classical music in Japan, and fascination with the violin in particular, were at an all-time high. This unprecedented growth spread similarly to Korea, Taiwan, and mainland China, resulting in new audiences, concerts, violinists, and collectors. In 1971, a particularly fine Stradivari known as the “Lady Blunt” was purchased at auction by Robin Loh for the record price of just over $200,000, signaling a new market. About that time, C. M. Sin, an avid collector from Hong Kong, purchased over twenty Stradivari and Guarneri del Gesù violins. In just a few years, the previously untapped Asian violin market had outgrown the American market. A unique collectible and an appreciating asset that has consistently increased in value for over 300 years, the value of great instruments has never decreased. A priceless work of art with a prestigious, highly functional, and visible application — performance on your instrument by international superstars for capacity audiences in the leading concert venues around the world and on best-selling recordings through the The Stradivari Society’s® instrument loan program. There was certainly no slackening in the American market, where orchestra members had become the highest paid in the world. American musicians were eager to use their new incomes as well as several tax incentives to make major instrument purchases. In addition, several active collectors in major American cities continued to acquire great violins. Thus, the violin market had become truly global in the 1970s. Three large markets — Asian, European, and American — put pressure on the limited number of fine violins. The prices reflected this change. 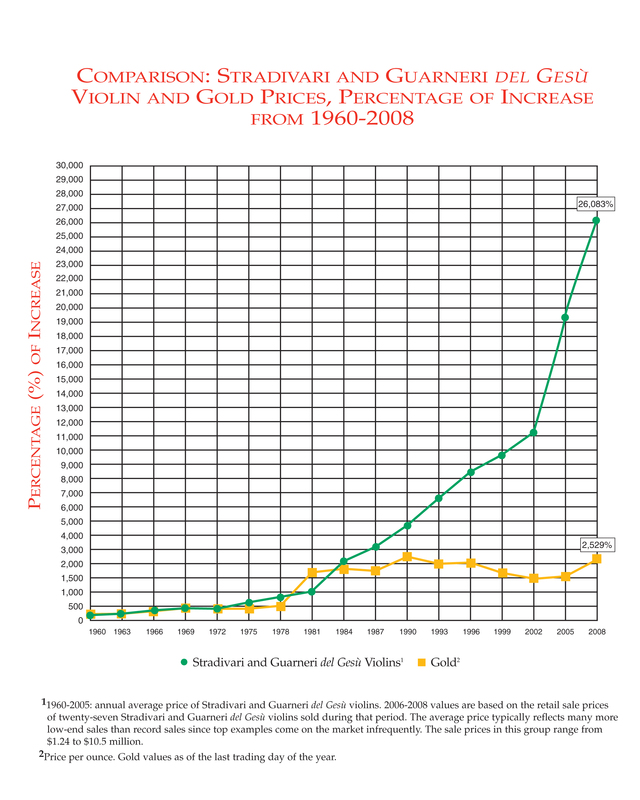 A fine example by Stradivari or Guarneri del Gesù could command as much as $500,000 in 1980, and the prices of all violins had increased in similar proportion. The market continued to expand into the 1980s, and by the 1990s exceptional instruments had crossed the million-dollar mark. Itzhak Perlman purchased the famous “Soil” Stradivari from Yehudi Menuhin for $1,250,000. 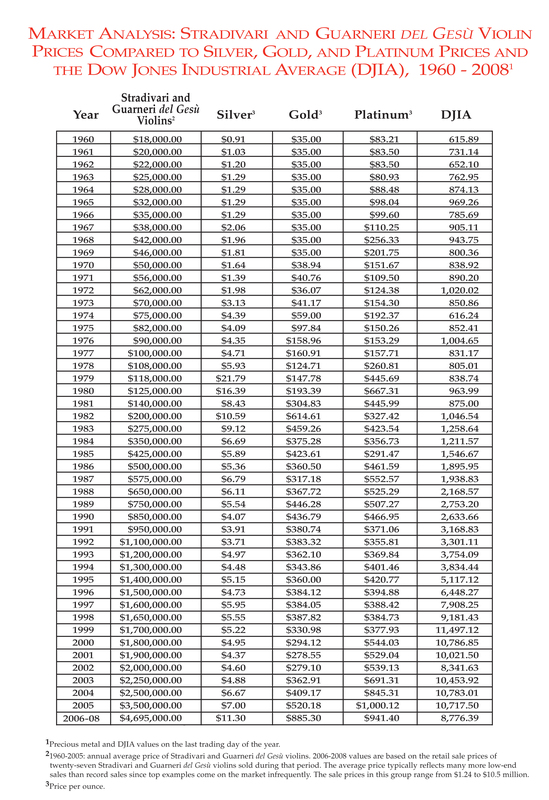 The first decade of the 21st century saw the demand and prices increase further with the top instruments commanding prices ranging between $6,000,000 and $18,000,000. As great instruments became less and less affordable, wealthy classical music enthusiasts have stepped forward to acquire great violins for use by rising stars. The idea of patronage is not a novel one, yet the significant change in recent decades has been the advent of patronage on an institutional basis and an international scale. This has had a significant impact on the violin market. The Stradivari Society currently has more than 25 instruments on loan to rising international stars with a total value in excess of $30,000,000. With prices ever on the rise, it is clear that precious and irreplaceable Stradivari and Guarneri instruments will continue to be heard in the hands of great artists only as a result of concerned individual and institutional sponsorship. There are many orchestras that have secured great instruments in Europe and America. The Chicago Symphony has two Stradivari violins for use by its members and The Los Angeles Philharmonic has a Stradivari violin and cello. In addition, most major orchestras have developed programs for assisting musicians with the loans they need to acquire instruments and Bein & Fushi has been an essential resource in this effort. The entry of large institutional buyers has had additional impact on the market by reducing the number of instruments that are available. The instruments they purchase are ostensibly off the market, intended to remain installed in the various institutions and museums forever. Of the Guarneri del Gesù violins generally accepted as the “top nine,” four belong to museums (Library of Congress, Paris Conservatory, City of Genoa Palazzo Tursi, and the Archaeological Museum of Zagreb) and will never be for sale. 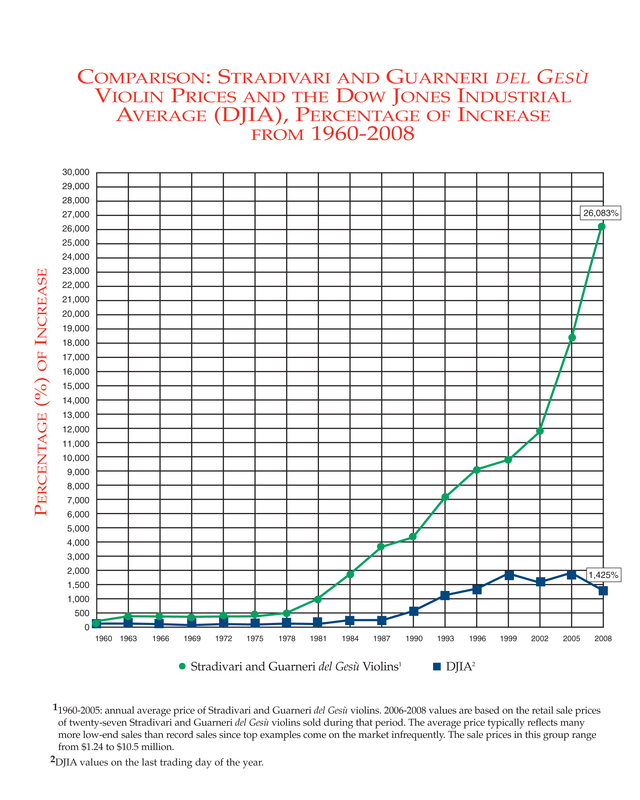 Each year, as foundations and museums hold an increasing percentage of the great, antique violins, the competition intensifies for the remaining instruments when they do become available, and the continued increases in violin prices of the current decade dramatically reflect this fact. Since 1990, we have seen a threefold increase in the value of Stradivari and Guarneri violins and instruments by other well-regarded makers. Most of the post-1700 Stradivari violins and post-1730 Guarneri violins currently sell in a range of $3,000,000 to $9,000,000, depending on their condition and historical significance. The greatest violinists throughout history, from Nicolò Paganini to Jascha Heifetz to Ruggiero Ricci to Itzhak Perlman, have used instruments by Antonio Stradivari and Giuseppe Guarneri del Gesù. The buying climate for instruments by Antonio Stradivari and Giuseppe Guarneri del Gesù has dramatically intensified over the last several decades. The demand is so great, with a total of only about 800 instruments existing, that the market for these instrumental masterworks is the strongest it has ever been. 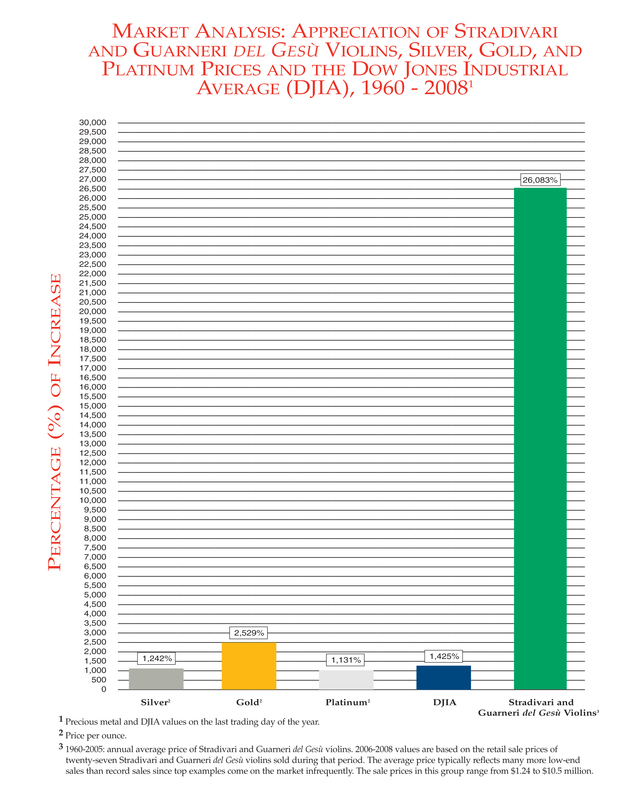 As can be seen in the graphs and table, not only have rare Italian instruments steadily increased in value but they also have never decreased in value and have consistently outperformed the Dow Jones Industrial Average (DJIA) as well as precious metals by an enormous percentage: a 19,400 percent increase for the violins versus up to 1,800 percent for precious metals and DJIA as of 2008. A unique factor that further increases the demand and value of these exquisite violins is their functionality. Unlike precious metal commodities or stocks, most of the instruments have been in active use since they were created and are absolutely essential to the careers of the upper echelon of musicians, both top international soloists and members of leading orchestras. These violins, violas, and cellos are enjoyed by millions of music lovers around the world in concerts and recordings. Recent rare instrument purchases have been mostly from Russia, Europe, Taiwan, and the United States. China will likely enter this market very soon due to the large talent pool of outstanding artists there as well as the unprecedented growth of the economy, which has already led to a great accumulation of wealth. Once the Chinese begin acquiring instruments, the price will begin to increase at an even more rapid pace. Conditions in the great antique instrument market today are similar to when the Japanese began acquiring rare instruments thirty years ago causing pricing to increase dramatically over the years. The difference today is that the rate of increase will likely be escalated since the availability of instruments will be less than ever before as these rare objects become increasingly dispersed worldwide. Every year several major violins are acquired by institutions that will hold the instruments in their collections for generations. Add to this that some instruments are irreparably damaged or stolen each year and the result is an irreplaceable product becoming increasingly scarce. Early Italian paintings were acquired by both public and private collections during the early years of the 20th century and subsequently have not been on the market for decades. We fully expect a similar situation to arise with the Italian instrumental masterworks within the next five to ten years. Scarcity, combined with functionality, continue to make great Italian stringed instruments an unparalleled investment now and in the future.